As I told my facebook readers Saturday morning, I had a few hours to get some meals prepped for the freezer while two of our girls were at bowling league. I had planned to make a 5 lb. bag of potatoes into twice baked potatoes, a triple batch of Green Chile Pork Tacos and one batch of Slow Cooker BBQ Pulled Pork (except this time I used root beer instead of cola). The four bags of pork literally took me about 15 minutes to put together, they were super easy. The potatoes had to bake for a good hour or so but then didn't take long to mix up the filling. All in all I probably spent a good two hours preparing everything. I now have 4 meals between the pulled pork and tacos and 22 twice baked potatoes, which will be enough for at least 4 meals for us. Wash and scrub potatoes, place on a large baking sheet and bake in oven for at least one hour at 400 degrees. Once potatoes are tender, cut in half and scoop potatoes out with a spoon into a large bowl. Add butter, sour cream, crumbled bacon, seasonings and chopped green onions to the potatoes. Mix together well with a potato masher. Scoop filling into potato skins and top with grated or shredded cheddar cheese. Place back on baking sheet and stick in the freezer for a good hour or two. Wrap each potato individually with saran wrap and stick in freezer bag. When ready to bake, remove from freezer and heat in oven until heated through. I found a great recipe for pork tacos in my Picky Palate cookbook. We've made in once before during the winter months and I figured it would be great to throw everything together in a freezer bag so it's ready to dump in the slow cooker. These are full of great Mexican flavor and our family really enjoys them! Season both sides of pork with salt, pepper and garlic powder. Place in freezer bag. Add Worcestershire sauce and tomatillo salsa to bag. Remove air from bag and seal shut. Label and stick in freezer. When ready to cook, remove from freezer and let thaw overnight. Dump into slow cooker and cook on low for at least 8 hours (If you think pork is getting dried out, you can add 1/4-1/2 c of water) Shred pork when done and return to juices. Serve on tortillas with desired toppings. I also worked on a new way of menu planning this weekend. Spring and summer are always so busy for us, with softball games for the girls during the week, my own hubby's softball schedule and I'll be back at the farmers' market this year on Saturday mornings selling baked goods. I try to keep our freezer stocked with meals and that really helps but even so we still find nights where we leave the house at 4:30 and won't return until late at night. Which means supper has to be on the go and in the cooler. I made a list of easy meals perfect for this time of year. Meals that won't require much thinking or planning on my part. 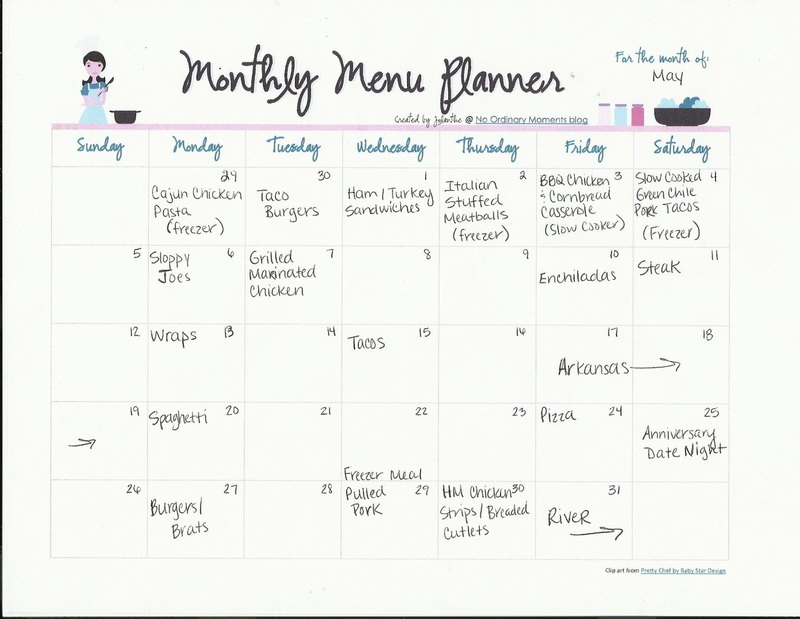 Meals that I'm sure you often rely on for your own families. 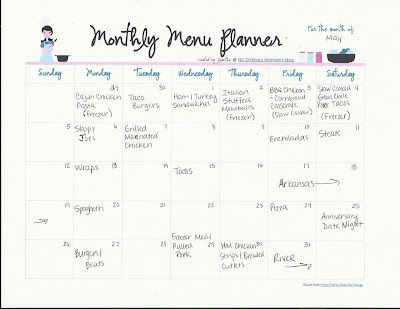 I simply started filling in days with simple meals, also leaving about 2 days blank each way so I can still try out new recipes. This way though I won't be overwhelmed with the idea of menu planning for our busy months but yet I can still have room for trying new dishes....hey I still have to blog about something right? We'll see how this idea goes, maybe it will be helpful and work out for the best.